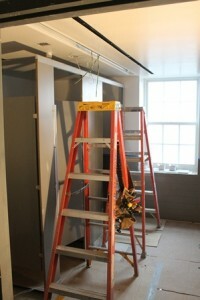 There is nothing more exciting than seeing some of the more visible changes happen in a renovations project. Recently, some seriously cool things have been happening on the south side of Centennial. For instance, little pops of color have been showing up all over the place. Each of the five floors in Centennial will have unique color schemes. Residents on the 2nd floor will be seeing green. 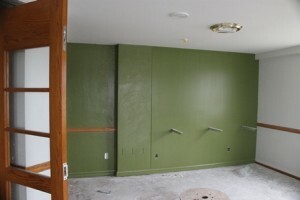 The 2nd floor will feature this green accent color. The green can be found in the laundry rooms, lounges, stairwell doors, scattered throughout the carpet, and near the elevators. Residents on the 4th floor better be prepared to have lots of Truman Spirit! 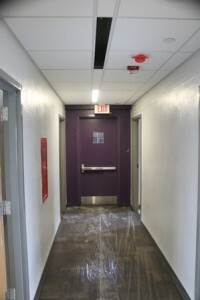 The 4th floor will be accented with a lovely shade of purple. 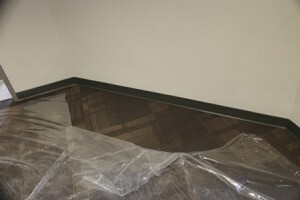 The purple will be in the 4th floor lounge, stairwell doors, scattered throughout the carpet, and near the elevator. Don’t the freshly painted walls, new carpet, new ceiling, and bright door go great together?! You might have noticed in the previous picture that there is carpet on the floor! Want to take a closer look? This carpet will be the primary carpet used throughout the building. Each floor will have accent carpet squares that correspond with the floor color scheme. On our last post we were able to show you the tile in the public restrooms. Within the past few days stalls have been added. Each public restroom will house multiple stalls. If you look at the ceiling in this picture you can see the beginnings of the new lighting features. Over the past semester we have shown you some of the progress that has been made on the south elevator shaft. But, now we have something even more exciting to show you! Do you seen that? Do you know what it is? If you guessed that it is the ACTUAL elevator, you would be be correct! 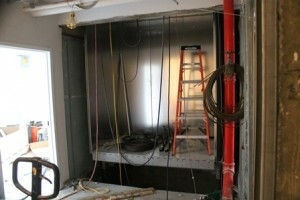 That’s right folks, the shell of the brand new elevator has been installed! Because the south elevator will no longer allow entrance from the exterior of the building, the area to the right of the elevator has become an additional entrance. 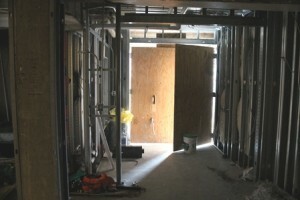 This space will feature 2 perimeter access doors and provide access into the building from the rear parking lot. 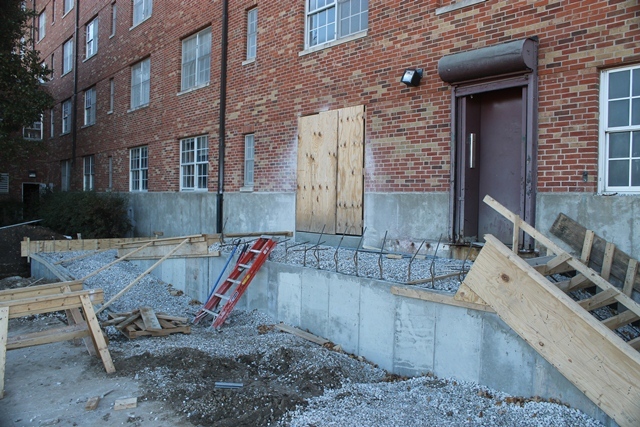 Remember the new ramp that was being built behind C-Hall? That ramp will lead to this new set of doors. It’s all starting to come together, don’t ya think? What are your thoughts on the new color schemes and carpet?